This afternoon was very cloudy and the wind was a little bit cool. After picking up the kids from their school and had a little time before cooking for dinner ... 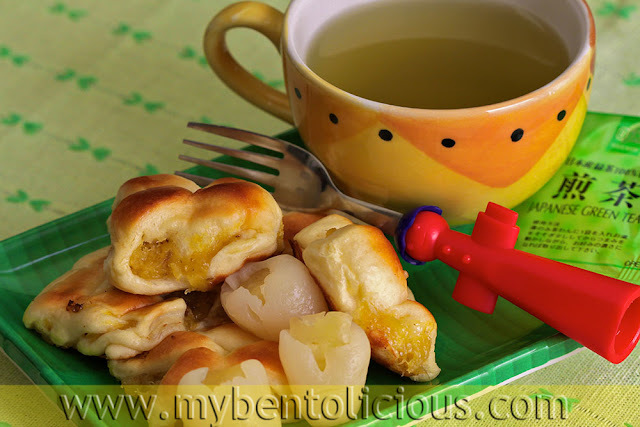 I enjoyed my hot Japanese Green Tea with pineapple bread (called 'roti unyil' because it is a very small bread). I bought the bread from Bogor, apparently this roti unyil is very famous. Many visitors from outside Bogor will always stop by to buy this type of bread. Because of the small size and the variations of the bread, many people including me are consider this bread as a good type of snacks. Besides pineapple bread, the store also makes chocolate bread, cheese bread, sausage and cheese bread, omelet bread, ham bread, banana choco bread, choco peanut bread, and many more ... all of them come in very small size of course. The kids are really like it. It's a good option to put into the kids' snack box. Yummy bread, I doubt that I could find anything like that in the UK, wonder if I could try making it?? I think perhaps the dough I use for the hot dog buns would work for this. I may have to experiment at the weekend!